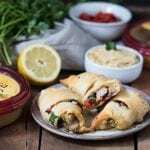 Celebrate National Hummus Day on May 13th, 2017 with this easy Crescent Wrapped Mediterranean Chicken appetizer! They are filled with hummus and perfect for dipping in hummus too! In March during National Nutrition Month I spoke with over twenty-five 9th grade health classes about basic nutrition and was surprised to find out that many of them ate hummus! It is kind of trendy now a days I think, but when I was in high school it was certainly not the thing to eat. Most of them just thought it was a dip (which yes, it technically is) but did not realize it is a great plant based protein and offers a host of nutritional benefits. It is made from chickpeas making it a rich plant based protein and high in fiber. It includes a winning combination of micronutrients such as iron, folate, and B vitamins. It is a great option for vegetarians and vegans due to the vitamin B found in hummus! Contains carbohydrates which may give you that extra boost of energy you need! The fiber content will also give you a feeling of satiety. 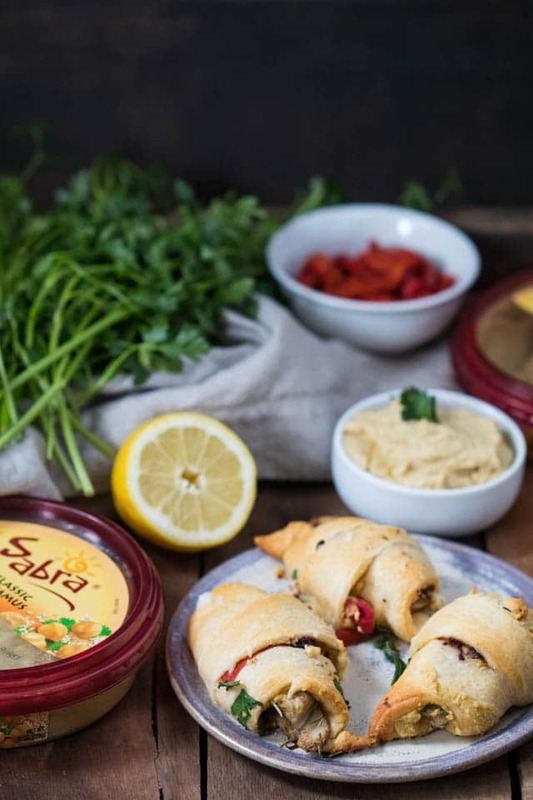 Happiness = Hummus, especially with Sabra Hummus! Many times hummus is used just for dipping and I wanted to incorporate it differently into a recipe! 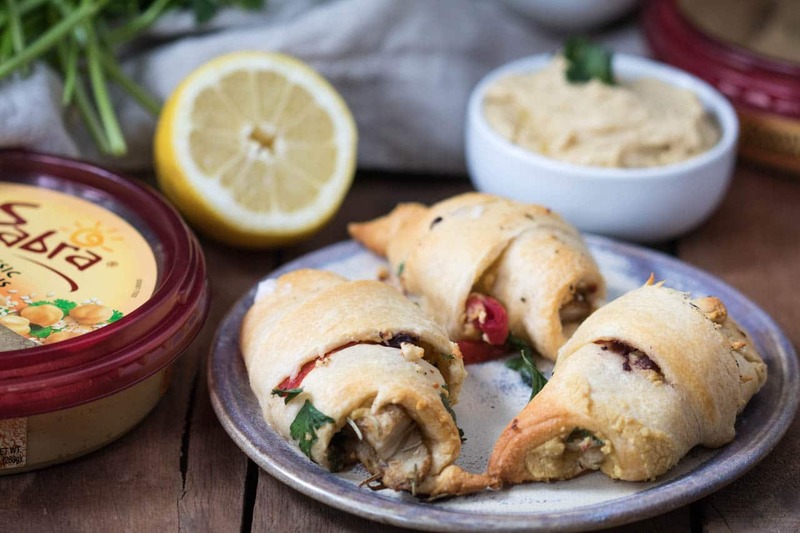 I thought of this crescent idea because when I am out to eat at a Mediterranean restaurant I find myself always dipping my chicken into the hummus in the middle of the table. I thought hey, why not make it an actual appetizer?! As a kid growing up, my mom would sometimes cook with crescent rolls and she always told me you can fill them with anything so I gave this recipe a go and it was a hit. (Moms are always right!). 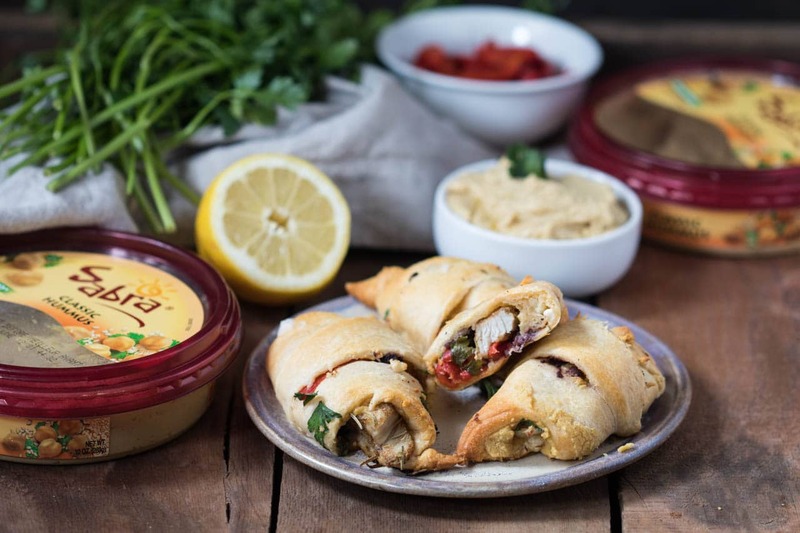 Celebrate your love for National Hummus Day (May 13th!) with these yummy hand held appetizers! 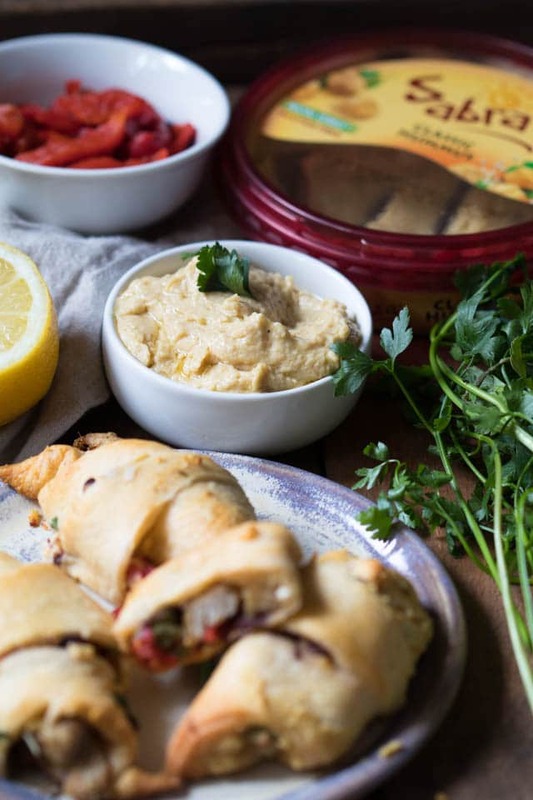 Celebrate National Hummus Day with these easy hummus filled appetizers! You will love the Mediterranean flavors! Preheat oven to 375 degrees F. Line a baking sheet with foil and spray with PAM. Set aside. In a frying pan over medium heat, warm olive oil and add chicken breast tenderloins. Cook with Mediterranean seasonings, lemon juice and garlic until chicken is no longer pink, or reaches internal temperature of 165 degrees F. Remove from pan and set aside on a plate. Roll out each crescent until they are flat. (Be gentle, they are fragile). Spread a thin layer of hummus on each roll and then place chicken, feta, olives, and sun dried tomatoes on top (~1 tsp of each topping). You may need to cut chicken tenders in half lengthwise depending on thickness of chicken. Roll each crescent roll up and bake in oven for ~14 minutes, or until crescent is golden brown. Serve warm with extra hummus and garnish with Italian parsley. I love this idea! Crescent rolls are so good, and this would be such an easy app. 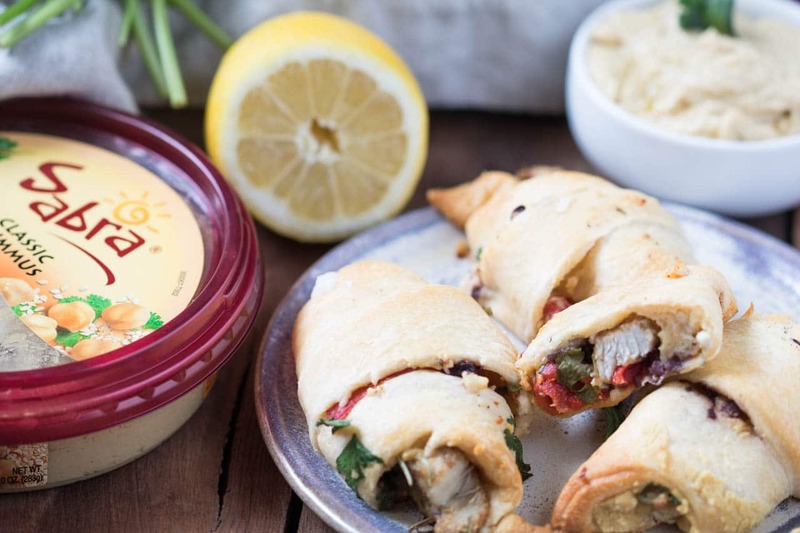 I love that you used chicken and hummus – I feel like most apps have zero protein. This ingredient list is making my mouth water. These look amazing! haha! Very true 🙂 It’s the best! Happy snacking! These sound (and look) amazing! These would be a huge hit at any summer get-together. These look like the perfect way to celebrate National Hummus Day! *-*! Yay for protein! Who doesn’t love crescent rolls??? These look so great! I think the whole family would love these, pinning for later! Thank you Abbey! 🙂 Hope you are having a great week! These look amazing – and what a perfect size! This is such a neat idea, Tawnie! 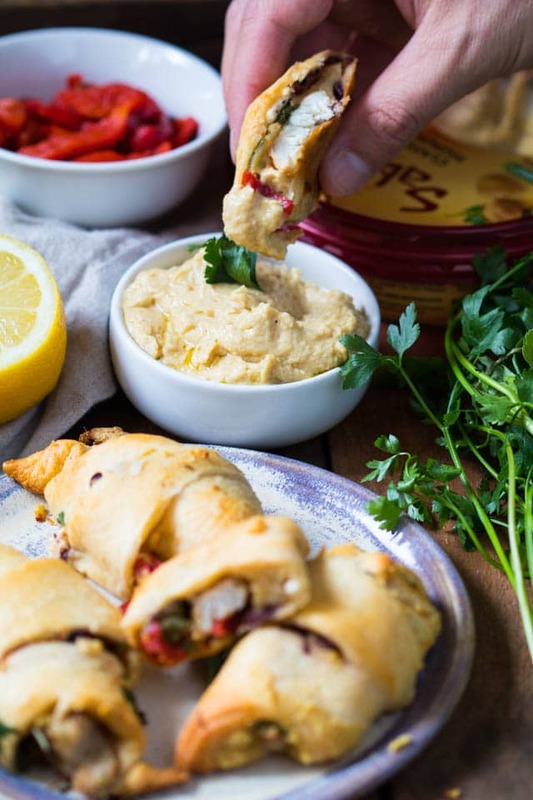 You combined two of my favs- crescent rolls and hummus! Seriously right!! haha, thank you! Oh man, these look super tasty, I want one (or two) right now! And yay for Supremely Spicy, that’s my fave too! These photos are absolutely gorgeous Tawnie! The rich Mediterranean colors! The recipe looks yummy too! SUPER creative!!! What an easy idea to serve up at get togethers this summer. We will be GRILLING all summer!